"An editing, recording and mixing studio for songs from your PC"
If you are looking for a software to manage your music and create innovating mixes, just take a look at this alternative. BPM Studio Pro is a recording application for audio that was specially developed to satisfy all DJs and music fan´s expectatives. From this studio, you will be able to read, write, edit, encode and even mix songs. This studio works with excellent precision thanks to a variety of professional features it offers. There is an encoder for MP3, a module for CD writing, playlist management, all essential controls for audio mixing from two built-in digital players, compatibility with 19 inches controllers (Exact replicas of the classic DENON CD-1000). The streaming option allows re-transmitting our mixing session via the internet. You will create outstanding mixes from a complete modern looking interface that shows all the essential features and buttons to work comfortably. It allows changing between three visualization modes: Ripper and Mixer, lists, and streamlining. In order to import songs, you can use the explorer view mode to see your music library and add your favourite tracks by just dragging and dropping. 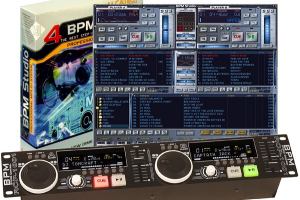 BPM Studio Pro is perfect for parties, radios, Djs and any place where the best music is allowed.